The KTM 390 Duke's weakest link is its brake system. The brakes lack bite, and lever travel is substantial. Although the force isn't lacking, confidence is. 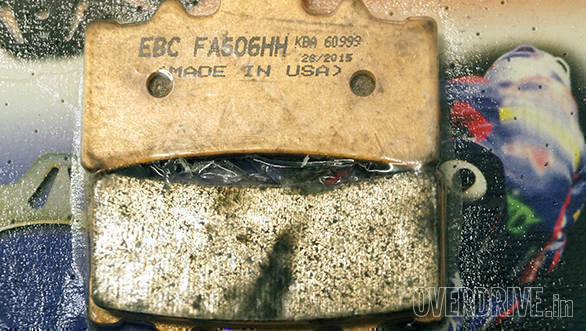 MotoUsher sent us a set of EBC Double-H sintered pads to try out. The Double-H's first H describes friction in effect - how hard the brakes will work. The second H describes hot friction on the fade and recovery cycle - how brakes will work once hot in intense use. Double-H is usually a racing as well as hard-use application choice. Sintered refers to the manufacturing process. Sintering - in this context - is the moulding of a metal under heat and pressure without actually melting the metal. 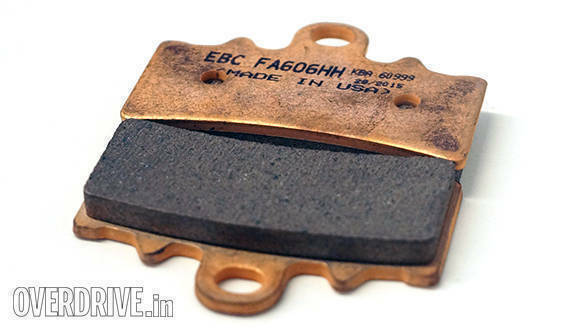 The EBC Double-H pads are primarily copper based and the advantages include significant increases in friction (hence brake force) and better heat dissipation (resistance to fade under hard use). 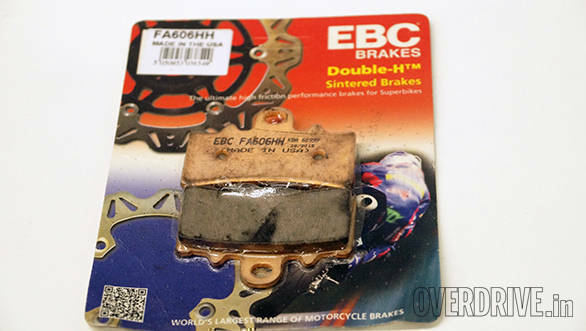 The EBC Double-H brake pad replaces the stock pads, and the replacement process takes less than 30 minutes to complete. On the KTM, the Double-H pads immediately felt stronger which reduced the lever travel needed to produce equivalent braking. I was also able to reach the ABS trigger point (maximum possible braking) with less effort repeatedly where the stock pads struggled with this. Sintered pads often feel harder in use than organic pads. This manifests as either an abrupt bite or a lack of initial bite. This lack of feedback can upset new riders. On the KTM, this wasn't an issue because the extra lever travel allows a fair range of modulation and feel - an unintended benefit. However, another colleague who's been using EBC Double-H pads on his RC390 reports notable rotor wear. Usually OE sintered pads are paired with harder rotors, and Double-H pads will steadily thin a normal rotor. The solution is to check rotor thickness regularly and replace the rotor when it falls out of tolerance. Given how inexpensive KTM parts are, this is not outrageously costly. The EBCs are a definite improvement over the stock KBX system's performance and if the price of the pads doesn't deter you, then I highly recommend switching the front over. Just remember that you'll have to ask your service tech to inspect front rotor thickness at each service once you make the switch.